Over the last many months I have had the great pleasure of meeting with teachers interested in expanding their outreach to 3DWebWorldz. To make it easier for teachers and educational institutions to understand the tools available to them, we have combined the frequently asked questions into this post. Please direct additional questions to our HELP DESK and subscribe to our blog to remain updated on our teaching tool updates. 3DWebworldz.com is a Virtual World in a Browser, which includes social interaction, communication tools, and avatars. A teacher would use this environment for online classes and real-time interaction with students. While users can log in as a guest, we highly recommend that all students register for an account. Many features are not available to guests. 3DPortals.com is the same collection of regions presented as 3D websites, a solo experience. A student might use this environment for a self-study assignment. No log in is required for 3DPortals.com. HOW DO I BUILD MY CLASSROOM or SCHOOL? 3DWebWorldz building tools are available to region owners and anyone a region owner grants permission (be cautious, builders have a lot of power). As with any new platform or virtual world, there is a learning curve. Video Building Tutorials. READY-MADE TEMPLATES: To make it easier, we have template regions to get you started. These regions have great versatility and can be customized to suit your needs. You can also build a region from scratch. If this section makes your head spin and you feel like a fish out of water, don't worry, there is one more option. You can tell us what you need and we will do the heavy lifting. PRIMS: Prims are geometric shapes that can be dropped into your region and manipulated in many ways, including but not limited to: size, shape, texture, animation, solid or phantom, add a sound, add a notecard popup, external link prompt, teleport prompt and more. MESH: Mesh can be manipulated with regard to shape and size, and animations can be applied. LIBRARIES: Textures and mesh available for common use are available in our libraries. CUSTOM MESH and TEXTURES: You can upload your own items. Many of our mesh builds are created in opensim and blender. Our favorite download site for free mesh is sketchfab.com. Please remember to give credit to the creator when prompted. 3DWebWorldz LIBRARIES: Our "Commons Library" is filled with textures and mesh you can use. You can also upload your own textures and mesh. The only limit to region size is that of your user's computer, graphics card, network connection and browser capability. There is no prim limit. We recommend keeping your regions small and connecting additional regions using doorways and elevators. Our staff is happy to help you build your region to match your vision. Bring your lesson plans to life and keep your students engaged in rooms they can visit and learn at their own pace. In addition to our learning and meeting templates, many of our art gallery templates would also suit this purpose. All regions can be set to public or private. Private regions allow you to offer access to specific registered users only. Guest Users are not able to enter private regions. What Teaching Tools are Available? In addition the communications tools (voice, worldwide chat, region chat, private IM) there are many interactive options, some of which you saw on the Academy Tour video above. Four of my personal favorite tools for teaching and presentations are the live chalkboard, slide presentation tool, quiz/testing tool, and the learning quest tool. Region rental is an easy process and new regions are set up within 24-48 Hours. Rent your Region - click here. Provide Region Information - click here. Students can be directed to log in through the MySchool3D.com page. Using that page to enter will land them directly in the MySchool3D Campus Lobby. Discord Server - terrific way to remain updated on all things 3DWebWorldz, as well as connect with users while they are offline. If you need immediate tech support, this is the best option. A2Z HelpDesk - Submit a help desk ticket to get support or request a consultation. Our helpdesk ticket response time is speedy, but as a general rule, not as fast as our Discord Server. 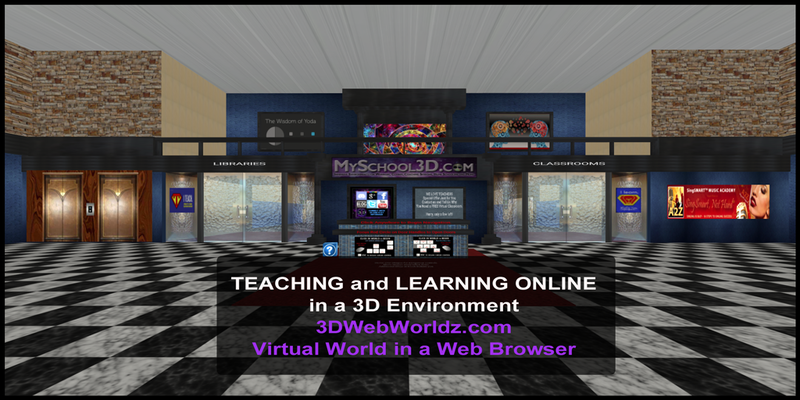 3DWebWorldz is dedicated to providing valuable educational resources to the community. If you need a tool that is not yet available in our User Building Tools, please contact us. We will be happy to discuss your ideas and help bring your vision to life.